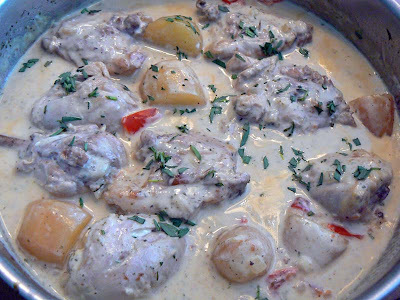 A recent lunch idea: chicken legs in a cream sauce with tarragon, served with carrots. The finished chicken in tarragon cream sauce. First the chicken pieces are browned, then simmered in white wine and shallots. After the liquid has reduced enough, the cream is added and reduced further to thicken. Fresh tarragon is added - we used some fresh from the garden and added some dried from the cupboard. 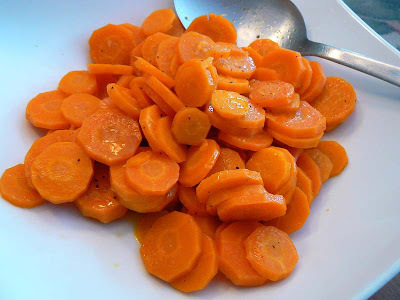 While this is happening, the carrots get cooked in butter, water, salt, and pepper. It's all served together with rice or millet. We added some leftover potatoes and half a chopped tomato. This served the two us for two days. Callie knows when it's time to go for a walk. Like most dogs, she's smart that way. 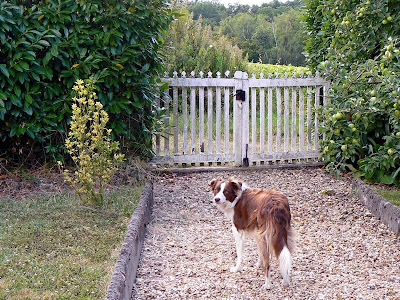 One time, she was so enthusiastic about going that she jumped over the gate that you see in the photo below. Border collies are excellent jumpers. C'mon, it's time to go! She only did that once, I think. It was either a case of exuberant puppy-hood (she's a little older now) or she actually learned (from our reaction) that she's not supposed to jump the gate. Recently she's been getting out of the yard again. She doesn't go far. One day I looked out the kitchen window just in time to see Callie casually wander into our neighbors' yard. I think she's just curious about the people and dogs and cats that she hears walk by on our little road. But I worry about the cars and tractors. I couldn't figure out how she was getting out because I never saw her do it, and I was pretty certain that she wasn't jumping over the gate. Ken had a theory. A few days ago we found out that his theory was correct. We were out back and watched as she got down on her belly and shoved herself through a little spot under the fence that the neighborhood cats use to get in and out of the yard at night. It's toward the back, along the road, under the hedge. I quickly patched the spot so she can't do that any more. Until she finds another spot. Yesterday, I did the flowers. Today, I'll do the veg itself. We're actually close to getting some produce out of this year's garden. 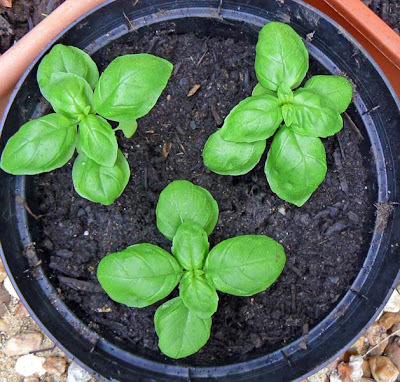 Basilic (basil) in a flower pot. I looked back at 2006 and noticed that by this time that year, we were harvesting a lot. This year, the garden got put in a few weeks late because we were having too much fun with friends and not working in the yard. 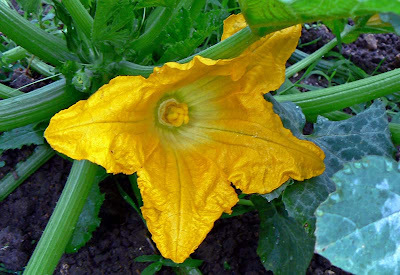 The courgettes (zucchini) get larger every day. If you remember, last year (2007) was pretty much a bust year for the garden. It was too wet and cold to get anything but the weeds to grow. We're hopeful that this year will be good and encourage us again for next year. Five rows of haricots verts (green beans). The fifth row, on the left, hasn't sprouted yet. One of my plans this year was to plant successive rows of green beans so that we'd have a good continuous harvest right into fall. Surplus beans will be blanched and frozen so that we can eat them during the winter. I'll let you know if it works. We're also looking forward to roasting and preserving our red bell peppers. They're great eaten with goat cheese or incorporated into a sauce. 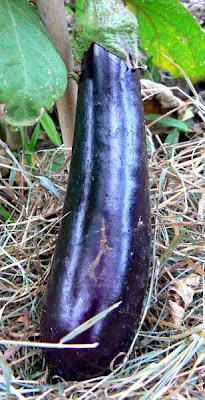 Our first aubergine (eggplant) of the year. And the eggplant, well, we just love eggplant. 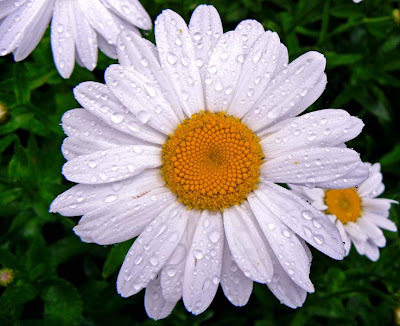 The plants we grew from seed have taken a long, long time to grow, and they're still small. But the two plants we bought at the market are in full flower and are producing fruit now. 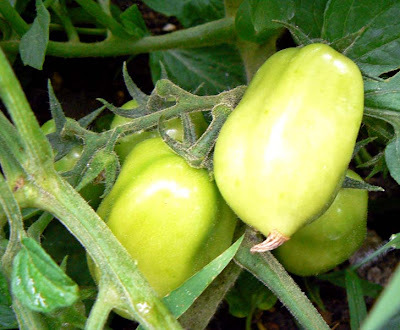 If the weather holds this year, the smaller plants might make it to production as well. The same happened with the tomatoes. We bought four plants because our seedlings were just not growing. Those plants have fruit on them now. But the seedlings are in the garden and are trying to catch up - in fact two of them have little blossoms forming now. Menthe (mint) and persil (parsley). We also have some herbs. Parsley and basil, mostly, but also some tarragon and coriander. Of course, the perennial herbs continue to do well (thyme, rosemary, sage). 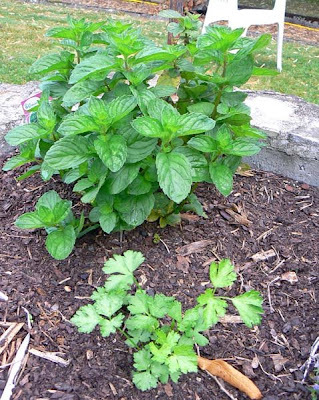 And this year we added mint to our perennial club. Our jardin potager (vegetable garden) is doing very well, despite a late start this year. I'm certain that it's because this summer has been so much nicer than last year. Sun and warmth were totally lacking in summer 2007. Right now, especially, we're seeing lots of blossoms. 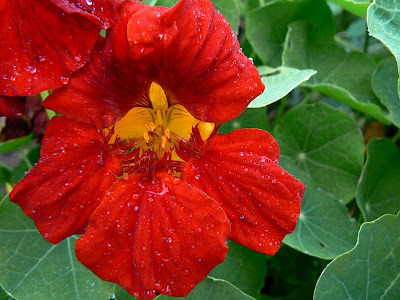 There are vegetables, too, but today I'm highlighting the flowers. 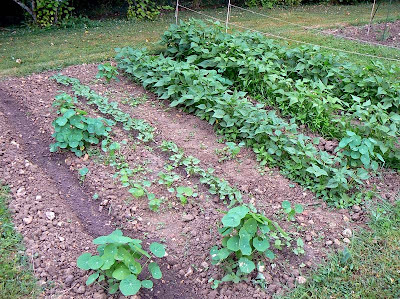 Some of the plants grew from seeds, like the haricots verts (green beans), courgettes (zucchini), and capucines (nasturtiums). 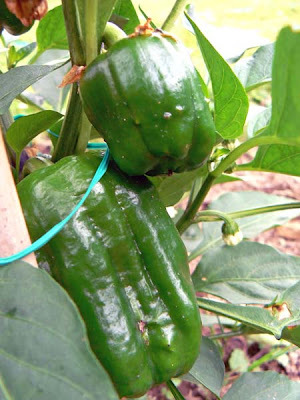 The capucines actually come up on their own, having re-seeded themselves from years past. I often have to pull a lot of them out since they don't all come up where I would prefer them to. 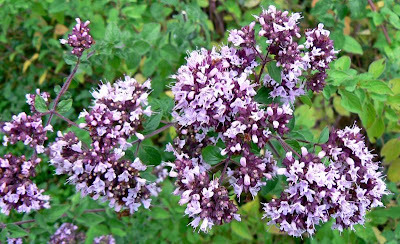 The origan (oregano) came up from plants that I had grown from seed last fall. 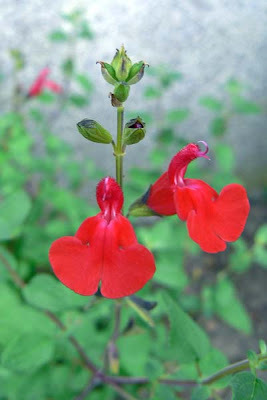 They came back much more vigorously this year, and are now flowering beautifully. I'm not sure they'll come up again, so I'll have to research that. 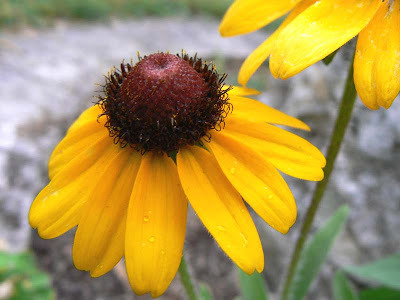 The marguerites (black-eyed susans) are volunteers as well, from seeds given to us by Chris from California, a frequent commenter on our blogs. I still have some seed packets to sow, which I'd better do before they get too old. And finally, the bergamot is actually flowering! These plants came from cuttings I took (swiped) from plants we saw at our gîte on the Ile d'Oléron in May. I didn't think they'd flower this year, but they have. Next year should be awsome! Bergamot Now I don't know what this is. We found duck gizzards on sale a while back, so we snapped them up. Today Friday we took some out to make a salade de gésiers for lunch. 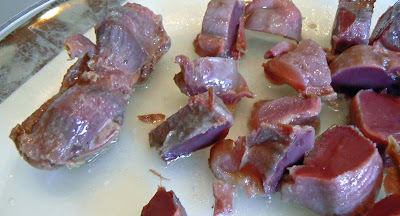 A whole duck gizzard on the left; sliced on the right. 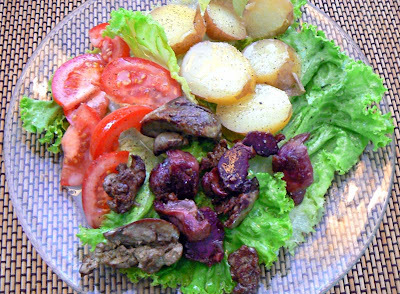 We added some chicken livers that Ken had preserved in duck fat (confits) and some tomato and potato to round it out. The gizzards got sliced up and sautéed with the liver until they browned a bit. Then the salad was served! 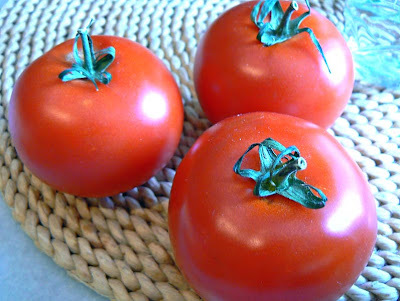 Supermarket tomatoes. Ours aren't ripe yet. On Monday we were invited to lunch at the summer house of our friends, H & A. We put Callie in the car and headed over - it's a short 15 minute drive from us. 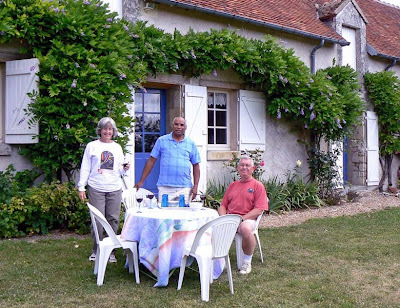 H & A (standing) and Ken, apéritifs before lunch. I have no food photos. I suppose I was too busy eating! We had a beet salad, pasta with an eggplant sauce, salad and cheese, and mango sorbet for dessert. Very tasty. 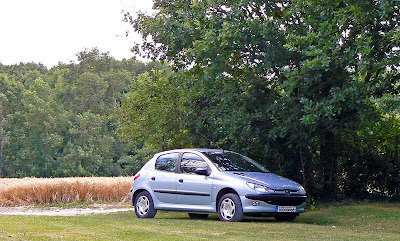 Our little Peugeot parked near the wheat field. 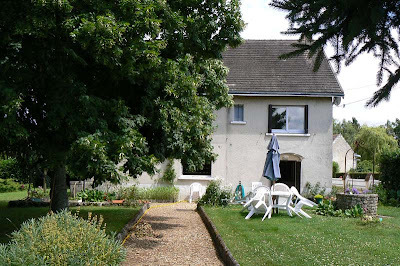 H's and A's house is a typical farmhouse in the longère style. These houses are one room deep, and the rooms are all connected by doorways. Originally the longère had a one-room living space. The other rooms were for farm animals and other farm activities. In the renovation, indoor plumbing and a bathroom had to be added. The stone house is very pretty, with several old wysterias clinging to it just under the eaves. 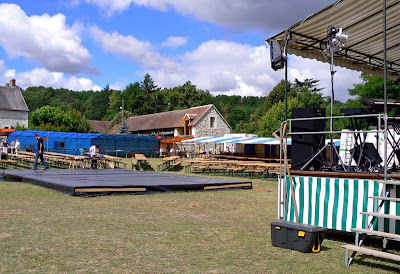 Every year right after the quatorze juillet, our little village holds its annual festival. It's called la fête des lumas, or the snail festival, and it was held this past Sunday. Now I now all you francophiles out there are saying, "but wait, I thought snail was escargot in French." 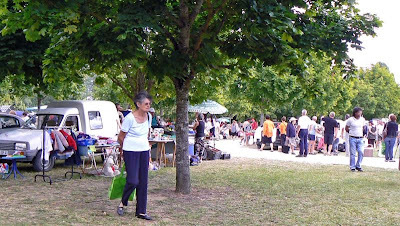 Part of the flea market that is the core of the snail festival. You are right, of course. Lumas is a specific species of snail also called the petit gris de Poitou, not to be confused with the classic escargot de Bourgogne. I believe they are both edible. I also believe that it would be difficult to tell the two apart once prepared in the traditional Burgundian style with garlic, butter, and parsely. Shopping for used vintage clothing. I have no idea why our village has a snail festival. 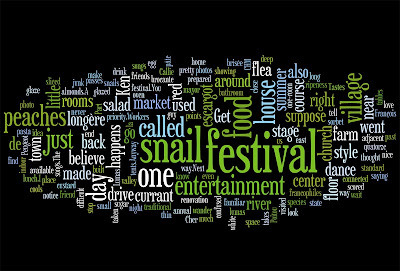 I've never heard of snails in town except for this festival, and the ones we find in the garden. I suppose one day I'll ask somebody, but it's not a high priority. picnic tables and food tents. 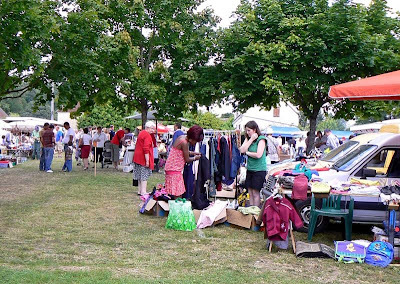 Anyway, the festival is mostly a big brocante, or flea market, all day long. There is food and drink available, and a dance floor and stage are built for the evening entertainment. This year's entertainment was a band called Get Back that does Beatles songs and a guy who sang Claude François songs. The festival takes place adjacent to the village campground, which happens to be on the river in the center of town. Ken and I didn't go for food or entertainment. We went around eleven a.m. just to wander around and have a look at all the junk for sale. And to be seen by our fellow villagers (we don't go out much). As it happened, we only saw one person we know, and he didn't even notice us. On our way back home, however, we ran into one of our neighbors (who happens to be the mayor) and her husband. So we had a nice chat, and scored points for showing up at a local event. The river Cher passes the center of town. As I lay in bed that night, I could hear some very familiar tunes wafting up from the valley below. Get back, Jojo. 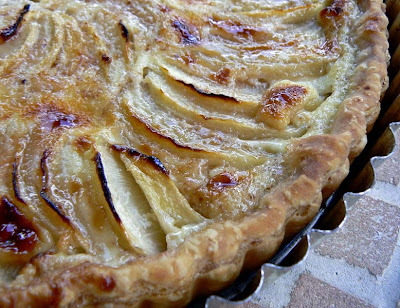 The peach tarte cools on the deck. 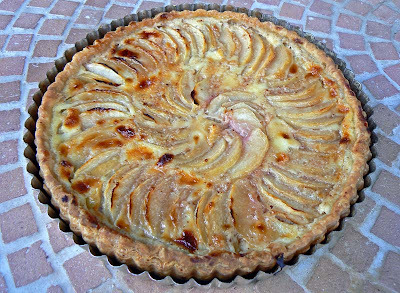 I started, of course, with my standard crust, the pâte brisée. Then Ken peeled the peaches and I sliced them up. I arranged them in the shell on a thin layer of ground almonds. A close up. These were white peaches, by the way. Next, I made a custard with milk, cream, sugar, and an egg. The tart went into the oven and toward the end of baking I glazed it with a red currant glaze (made with red currant jelly). Tastes like summer! 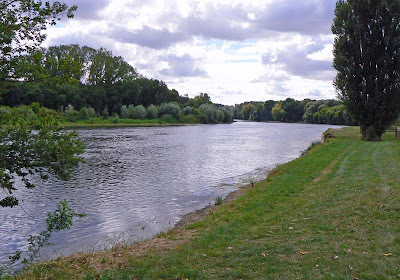 Cunault is small town on the Loire River near Saumur. It's quite a drive from where we live, being west of Tours, while we are to the east. But the church there is worth a stop if you're in the area. 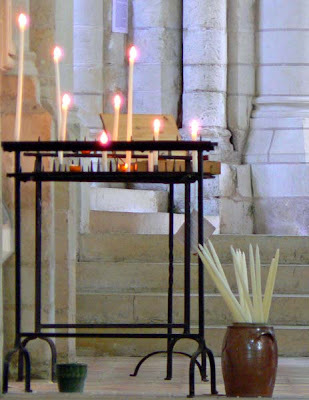 I love the candles in the pot on the floor. This photo was taken in 2006 when we visited the church with our friend CHM. You can see a few more images from that day here. 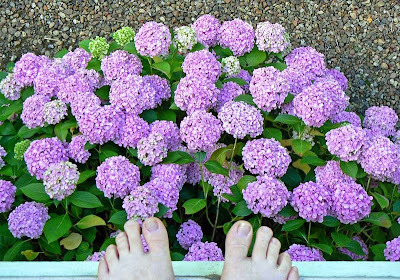 Hortensia, in French. This specimen grows on the north side of our house. When we first got here, it was a beautiful blue. Someone, obviously, had been feeding it the proper combination of chemicals. Looking down from the deck, feet and all. We don't do anything, other than prune it back every year. Consequently, it's resumed a more pinkish color. Not that there's anything wrong with that. A closer look. Still from the deck. 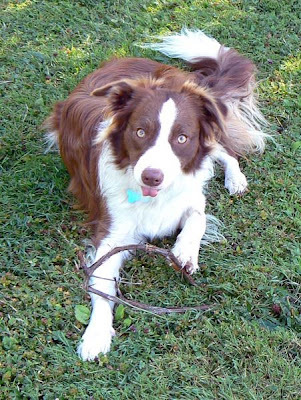 When Callie gets a hold of a stick, or other chew thing, she goes into a sort of trance. Her eyes roll back in her head. Her tongue sticks out. It's fun to watch. In this photo, I caught her tongue, but her eyes had resumed a normal position. This stick is a piece of grape vine that she brought back from one of our walks. 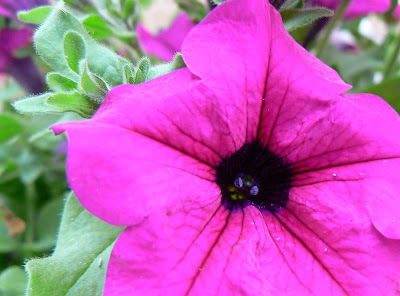 Surfinia is a common variety of petunia around these parts. It's a fast grower and cascades out of its pot. This is the second year we've planted them in the window box outside the kitchen. 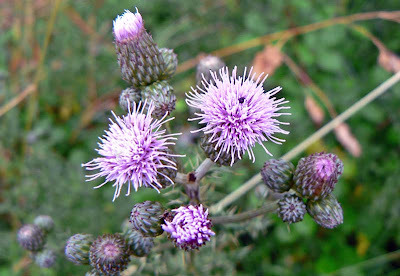 The first batch were very dark purple, almost midnight blue in color, like the center part of the flower pictured above. 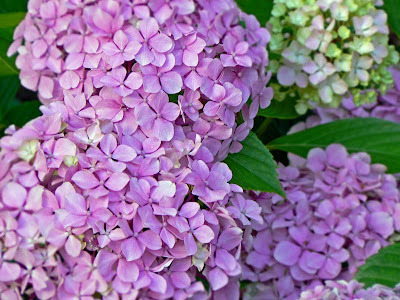 This year we put in a mix: bright purple and white. 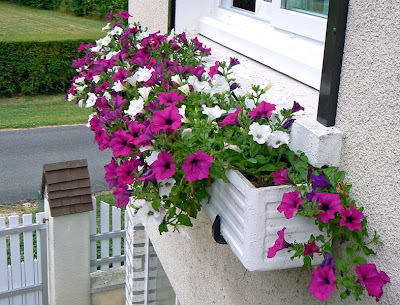 There's another window box in the attic window just above this one, but it sits empty. Getting up to the attic to tend to a flower box is just not practical, especially since we took the attic ladder down. Weeds do tend to grow out of that box in the spring, but they dry up pretty quickly without water. What does one do when one has a package of pine nuts that's about to expire? 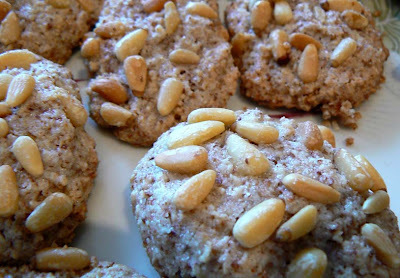 One makes pine nut cookies, bien sûr! The cookies are traditionally in the shape of little crescents, but I was lazy and just made them round. They still taste the same. I've made them before, about a year ago (see recipe here). But this time I used a different recipe, and the cookies looked completely different. This batch called for equal parts almond flour and sugar, whereas the other recipe had them at two to one. Also, this recipe only used egg whites, while the other used whole eggs. Finally, this recipe used a cooler oven, which partly explains why my last batch burned slightly. 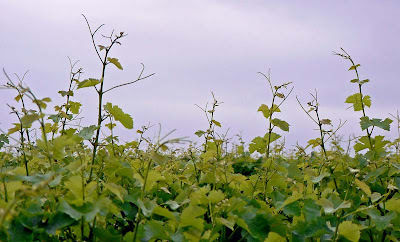 The vines continue to grow, but the wine-maker would rather see the plants' energy put into producing good fruit, so every few weeks he comes by and chops these shoots off. These tall shoots are now history. A sunny July Fourteenth for us here in central France. I hope it gets warmer. Happy Bastille Day! I saw this out in the vineyard the other day. 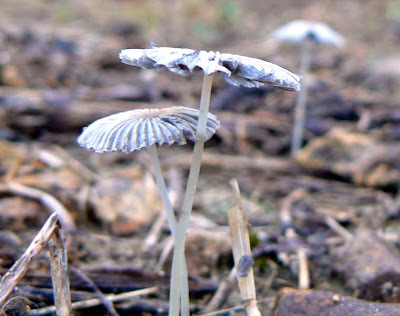 Teeny, tiny mushrooms in a tractor rut. 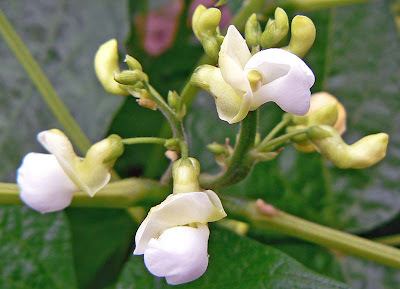 They're very delicate, and no more than two or three centimeters high. I put the camera on the ground for this shot. This is the view of part of the back yard from the bedroom window, looking west. The loud drops you hear are coming off the eaves onto an awning that protects the back door downstairs. And other things. We had a couple rain events over the past days. No warm woolen mittens needed. Yet. 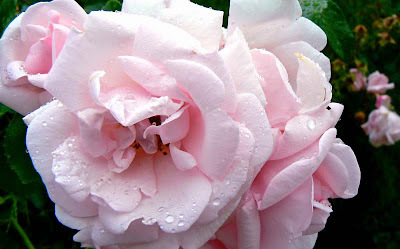 Neighbors' roses, kissed by rain. It's hard not to be weather-obsessed. The weather controls a lot of what we do and how we feel every day. Summer is supposed to be warm, and when it's not warm, we wonder. But the warm days make up for it all. And the hot days remind us that we really don't like very hot weather. We want it to be perfect. Mid twenties (upper seventies F) are just dandy, thank you. But the weather is seldom perfect. Oh well. Four and one-half years separate these two photos of our house. The view is of the back of the house from the garden. The first I took in January 2004. The second I took in July 2008. In four and a half years, we've changed some windows and made other improvements. Otherwise, it's just the same view in different seasons. 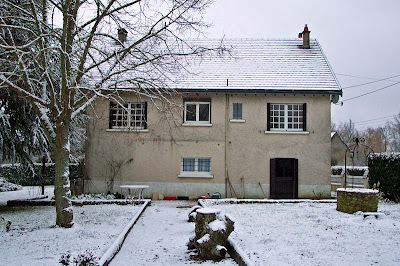 January 2004, our first winter in the house. July 2008, our fifth summer in the house. There's a long prologue to this story, but I won't bore you with it. The short version is that our friend Cheryl had brought a gift from the US for someone that she didn't end up seeing, so the gift was re-gifted to us. And we were glad to get it. 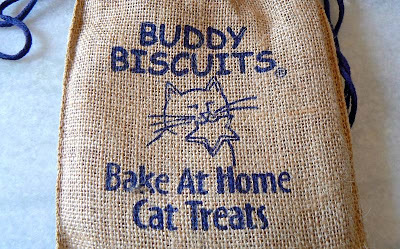 Buddy Biscuits come in a nifty drawstring burlap bag! It was a batch of make-at-home cat biscuits called Buddy Biscuits. 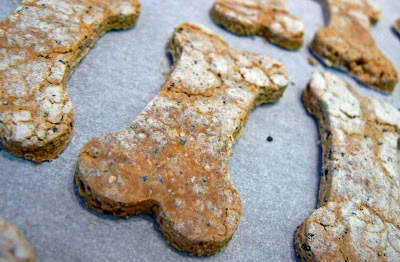 Cheryl had brought us a batch of the dog version back in 2003 for Collette, which we made and she loved. The biscuits are baked on a cookie sheet. The ingredients for the cat biscuits are as follows: yellow corn meal, whole wheat flour, dehydrated cooked chicken, dehydrated poultry liver, custom blend of natural herbs and spices, dried egg whites, dried brewers yeast, and lecithin. I figured that there's nothing in there a dog wouldn't like. Heck, I'd eat 'em! So I baked them up for Callie on Sunday. I used the dog bone cookie cutter that came with the 2003 batch instead of the little star shaped cutter for the cat version. The dog still has her pride, you know. She smelled the dough right away and sat at attention next to the counter while I rolled and cut out the biscuit shapes. I did give her a little of the raw dough. I drew the line at letting her lick the bowl. I made pizza on Saturday for lunch. It's not unusual; I make pizza pretty often. 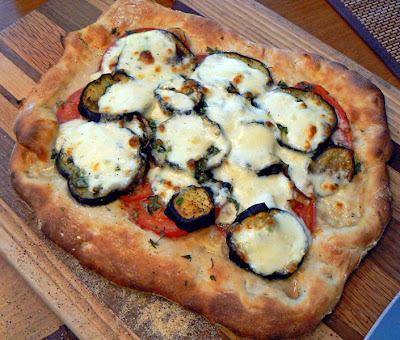 On Saturday we had an eggplant, some fresh tomato, and some mozzarella. I whipped up a pizza crust and, while it was rising, I sliced and baked the eggplant. Pizza #1. I didn't photograph the second one. Then I got some fresh oregano and thyme from the garden, sliced the tomatoes and the cheese, and heated up the oven. I made two of these, one for each of us. Ken remembered some onion that was in the fridge and we sautéed that for the second pizza. Boy, was it tasty! Proof about 10 grams of active dry yeast in 3/4 cup of warm water, to which you have added a teaspoon of honey. After about ten or fifteen minutes, mix the yeast into 2 cups flour with a pinch of salt. Add about a teaspoon of olive oil. Mix until the dough comes together. It should be smooth and silky and a bit sticky. Knead the dough for about five minutes. This can all be done in a Kitchen Aid type mixer, or by hand on a cool surface. Put the dough in a bowl that has been rubbed with a bit of olive oil. Cover with a clean wet towel and let it rise in a warm place for at least an hour. You can make the dough the night before and let it rise overnight in the refrigerator, covered with plastic wrap. Let it warm up for an hour or two outside the fridge before you use it. After the first rise, punch down the dough and form your pizza crusts. Cover them with a clean towel and let them rise for another fifteen to thirty minutes on a floured surface (so they won't stick). I use a pizza stone in a very hot (250º-300ºC) oven. That's between 480º and 570ºF. Garnish and bake your pizzas until they're done!